Music is one of the most common types of art. There are many music styles and trends in the world. There are also a lot of very different musicians in the world. Everyone has its own personal preferences and tastes in this area, and many people do not imagine their life without music. Different musical devices were created in order to give people the opportunity to listen favorite music at a convenient time – from antique music boxes to modern Mp3 players. This article will be devoted to the consideration of tips on how to choose a good mp3 player. Let’s start with a consideration of what is mp3 format. Mp3 is a special format for storing digital information with a high level of compression. A large amount of audio information can be placed in a relatively small mp3 files due to this. For example, a Mp3 file with the volume of 3.0 MB can fit song duration of 3-4 minutes. Then, as this same song in WAV format can take 25-30 MB. For example, a 3.0 MB Mp3 file can hold songs with duration of 3-4 minutes. This same song in WAV format can take 25-30 MB. Sure, compressing slightly affects the sound quality, but this effect is so small that in the average terms you simply will not notice it. Portable Mp3 player is a special small size device, which is designed to play Mp3 audio files mostly through headphones, although many models can connect other output devices. 1. The type and amount of mp3 player memory. Most modern mp3 players use two types of memory depending on the storage type: flash memory or hard disk. Mp3 players with flash memory. Players with this type of memory have a sufficiently small size and lower power consumption. Such devices are more resistant to various external influences such as shocks, bumps etc. However, flash memory has a relatively small amount of storage, up to 32 GB in most cases. Mp3 players with hard disk memory. Players which store information on hard disk are a bit larger than flash memory mp3 players. They also consume more energy. These players should be treated more carefully, because the disc may be sufficiently sensitive to external influences. Main advantage of these devices is the volume of information you can write to them. A high capacity mp3 player has amount of memory up to 160 GB at the moment. A memory expansion slot is in many Mp3 players. This is a special slot where you can insert memory cards and through this expand player memory. If you like to listen to music during your sporting facilities or in public transport you should pay your attention to flash mp3 player with 8-16 GB of flash memory. 2. Type of electric power. Two types of power used in Mp3 players basically: standard batteries and rechargeable batteries (accumulators). Convenience of using of standard batteries is that they can always be easily replaced. However, the standard batteries is rarely used, because their permanent replacement costs money, and for players with hard disk these batteries are not energy efficient. Most modern Mp3 players used special rechargeable batteries for this reason. Pay your attention to the capacity of accumulator, which is measured in milliamp-hours (mAh) when choosing a player. This parameter always indicated on the batteries – e.g. 720 mAh. Greater capacity of battery allows MP3 player work longer without recharging. 3. Presence and features of the display. Many Mp3 players have a display that can be used for device control and for media purposes. These devices have already called media players, but still they are also called video mp3 players. If you only need a player for listening music – choose the model without display or with the simple monochrome display. Why pay more? 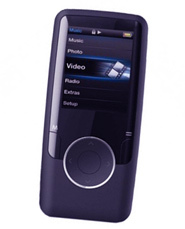 But if you want, except listening music, to watch videos – choose digital mp3 player with a color display. 4. Number of supported formats. Although players are called Mp3, but it does not mean that they can not play other file types. They can support WAV, WMA, AAC, OGG, M4A formats and other in addition to the standard format. Player can to play video files AVI, MPEG, MP4, 3GP, as well as to display different images (JPG, GIF, BMP, etc.) if it has a color display. Mp3 player that supports more formats is better, but do not overpay for supporting formats that you never use. – Wi-Fi, which helps to connect the player to the Internet. Additional features make using of the player more comfortable and diversified, but their presence is a matter of taste and depends on your financial capabilities. I hope that now, after reading the article, you’ll know exactly, which mp3 player to buy.